I'm a mix-matcher. I LOVE to mix and match. I think it's hereditary. hey, thanks so much for responding to my comment! not a lot of people do or they just visit my chictopia profile, so I'm always pleasantly surprised when someone actually visits my blog. I really appreciate it. Your blog is lovely and I would love to follow each other. I'll follow you as soon as I'm done writing this. Again, thank you so much! What?? Dior sunglasses? You lucky duck you. Obviously beyond jealous of those babies. They look so fantastic on you. I really love how you've paired the striped shirt with the lace shorts as well. Comptoir des Cotonniers!! That was EVERYWHERE in Pareeesss. Great choice. They look great and summery. I love love love that picture where your head is out of focus and your body is in focus. So cool! Love the outfit and dying over your necklace! It appears they are sold out, it looks just like the Dani Jo necklace on shopbop I've been eyeing!! 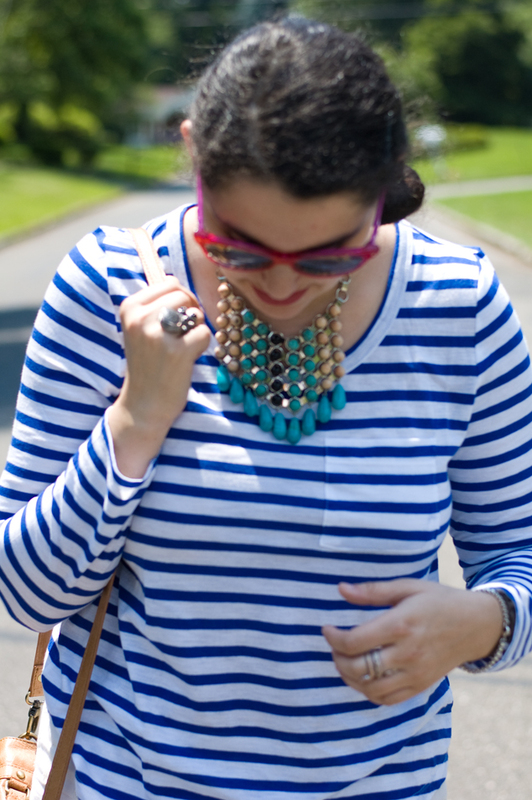 Love the statement necklace with that striped tee! Lovely summerish look and beautiful necklace! Loving the stripes with the embroidered shorts! So cute! Amazing outfit! !, i love the necklace! !, i follow you now :), kisses. you always have the best necklaces and sunglasses! Love the stripes and scalloped shorts! So lovely! I love the necklace and our sunglass it's pretty! I am already a follower by bloglovin!! hey, just wanted to add that I am now following you on bloglovin'. I can't wait to see more of your posts and beautiful outfits! Very head-to-toe, here! Love how put together this is. love the stripes, bag, and shoes.. all of it. me encanta tu outfit! !1 te ves preciosa! I love the shorts! How pretty. Que monada de pantalones, me encantan!! LOVE this outfit! those shorts are incredible and the lace with the stripes just screams summer in the best way!